Hey altrocklifers! Tomorrow I’m lucky enough to be jetting off to the beautiful El Campello in Spain for a 10 day family holiday. Try not to be too jealous of me while I’m sunbathing by the Mediterranean, reading books and drinking plenty of cocktails. I’ve just about finished packing, so take a look at the clothes I’m taking on holiday with me. What do you think of the contents of my suitcase? Are there any summer essentials that I’ve missed out? Let me know on Facebook or Twitter. If your weather is anything like mine is here in Bournemouth, planning your outfit each day is becoming more and more of a task. The British weather is at that annoying in-between stage, where you don’t want to be that person wearing shorts and flip-flops on a rainy day, but equally you don’t want to be wearing a heavy coat on the warmest day of the week. Oh Mother Nature, why must you be so fickle and cruel? But have no fear, altrocklife is here to help! Here are my top tips for managing the awkward spring weather. Getting an idea of what the weather will be like before you go to bed will help to reduce stress in the morning. In order to even further reduce stress, I tend to pick out the next day’s outfit in the evening and have it ready for when I wake up. Make sure you double check the weather before you get dressed in the morning, in case the forecast takes a turn for the worst (or best!). These bands of high and low pressure are extremely fickle. Ah, humidity, the destroyer of hairstyles. And potentially outfits, if you ignore it! Maybe the temperature is only going to reach a high of thirteen or fourteen celsius, but if you pair that with 91% humidity it could end up being a sticky day. On days with low(ish) temperatures and high humidity, I’d recommend a couple of lightweight layers paired with rolled-up jeans and ankle boots, to keep you from sweating everywhere or getting chilly as the evening rolls in. No longer do you have to put on a bra, vest, t-shirt, jumper, coat and scarf before leaving the house, hooray! As soon as April comes around it’s officially time to work thick, bulky items out of your wardrobe. Say goodbye to knitted scarves, thick jumpers, beanies and heavy coats until October. Instead, if you’re still feeling the chill layer up a cami, shirt and statement jacket underneath a lightweight mac. Plus, tights under shorts are definitely a thing. Stay looking summery and chilled whilst protecting your pins from the spring chill. This tip is a bit of a cop-out, but something I do on the regular. If you’ve put together a lovely, lightweight warm-weather outfit only to realise it’s going to be cold all day, wear it anyway with a nice colour-coordinating coat over the top. Wear the coat open to show off your outfit while you’re indoors, but as soon as you leave the office or uni button that bad boy up to keep the chill at bay. Et voila! You can still look on-trend and lovely in your nice warm office, and if you look a bit bundled up on the way home, who cares? Secretly, everyone’s jealous that they’re not brave enough to wear such a summery outfit. What are your transition wardrobe tips? Let me know in the comments or on Facebook or Twitter. That’s right, it’s Vintage Fair time again! Yesterday’s fair was by far the most productive of the lot for me in terms of the amount I spent. Oh well, that’s what overdrafts are for, right? I couldn’t resist getting a photo of those gorgeous light fittings. They’re so cute! 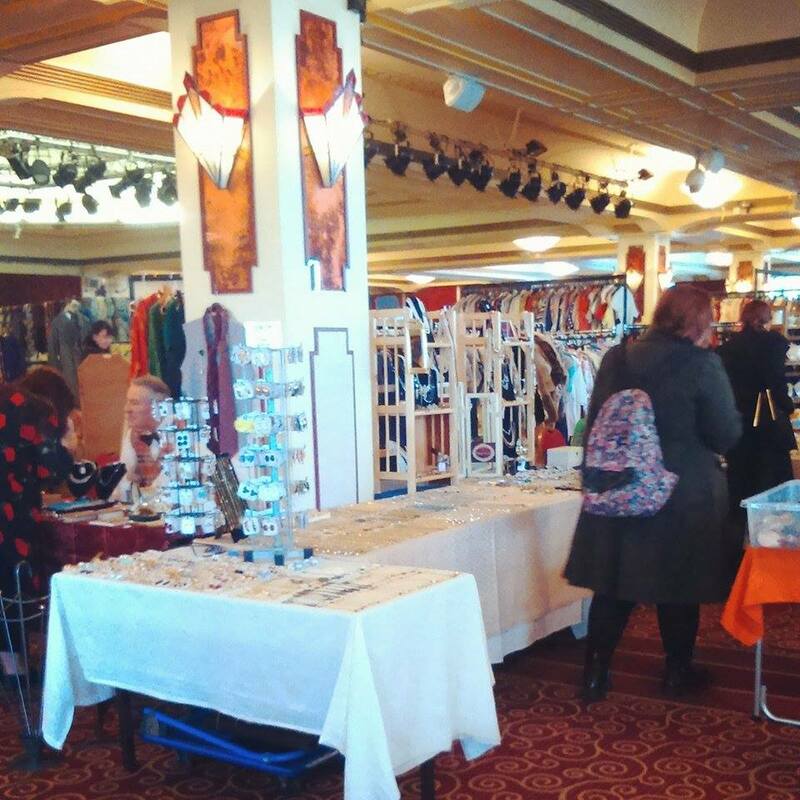 If you saw my review of February’s Vintage fair, then you’ll remember that I was a little disappointed at the selection – or lack of selection – of stalls. Thankfully, the selection of vendors at yesterday’s fair was much improved. There was a good mixture of vendors I’ve seen at the past two fairs, and brand new vendors to mix things up a bit. That’s definitely a good thing, as the fairs in October and February were very similar in terms of the items available. Yesterday there were multiple stalls selling modern dresses in the 50s pin-up style, and I was extremely happy about this! I’ve been hoping to pick up a new dress at a vintage fair ever since I started going in October, so to finally buy the dress of my dreams was a great moment. As well as everything pictured above, I also picked up a birthday present for my little sister – never mind that her birthday isn’t until September, it was the perfect gift for her! I can’t wait to find an excuse to wear this dress, as I absolutely love it! It’s such high quality, and considering how difficult it is for me to find dresses that fit well, this one is perfect for me. Have you been to one of Lou Lou’s Vintage Fairs recently? What did you pick up? Let me know in the comments or on Facebook or Twitter. As much as I love the brand Drop Dead, its clothes are usually out of my price range, and I’m sure many of my readers can relate to that! Unfortunately as an unemployed student it’s extremely difficult for me to splash out on clothes from independent brands such as Drop Dead. That’s why I always make the most of flash sales, such as the sale Drop Dead held the weekend before last. I was super tempted to pick up a pair of their Peace Walker Boots, which I absolutely adore, but unfortunately there wasn’t quite enough knocked off the price for me to be able to consider them. Instead, fuelled by my new love of crop tops, I picked up the Fangz Crop Shirt for the reasonable price of £24 (+ shipping). I was surprised by how baggy the top was, actually; Drop Dead tends to run small, especially in women’s clothing, so I expected the size 12 Fangz top to fit a little more snugly. It’s not too baggy to put me off wearing it, though! Apologies for the dirty mirror – I’ll get round to my spring cleaning eventually! I really love this top: the detail of the embroidered fangs is a really nice feature. The collar is reinforced, which means it won’t end up crumpled and misshapen in the wash. I also like the sleeves being a little longer, almost elbow length – they help protect the world from seeing my flabby upper arms. I wore this top out for my friend’s birthday on Friday night, and paired it with denim shorts and black heeled boots. However, it could also easily be worn as part of a casual outfit. 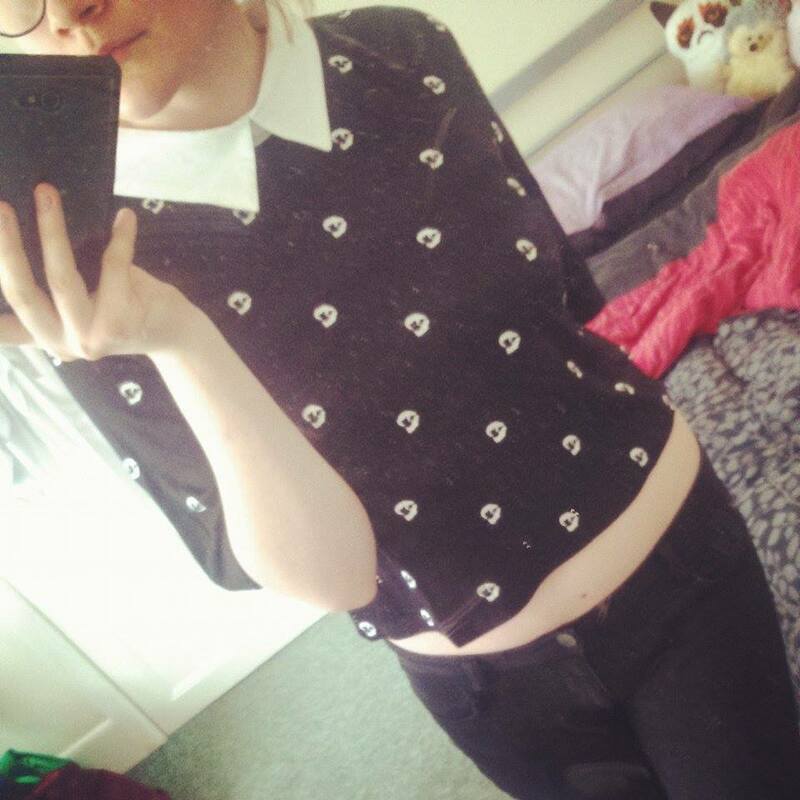 If I was wearing the Fangz Crop Shirt to uni I’d pair it with high waisted jeans, a chunky cardigan and ankle boots. It’s (gradually) starting to get warmer now, so when the sun does eventually decide to come out I can see myself wearing this shirt to the beach over a swimming costume with my favourite sunglasses. Once again, Drop Dead hasn’t failed to impress me. I’ll be keeping my eyes open for their next sale, and who knows, maybe some day I’ll be able to afford the Peace Walker Boots! Currently listening to: Younger – letlive. So, summer is gradually melting away into autumn (not that you’d know it here in Bournemouth – it was 24 Celsius today, whaaaat?) which means cooler days, less sun and chilly breezes. This outfit is a great transition outfit – a thick chunky-knit cardigan works really well with checked shirts, and if cardigans aren’t a sign that autumn is coming, what is? The shirt adds some colour to the outfit, and the rich blue, forest green and deep red are great colours for this season. Turned-up jeans add a summery feel, but the light grey denim is good for reminding us that there should still be a bit more sun to come this year. Combined with chunky-heeled ankle boots, which are great protection from light showers and puddles, you shouldn’t need any more layers to keep you toasty all day long. What do you think of this outfit? How would you wear it differently? Let me know in the comments or on Twitter!